A nuclear explosion has whittled down our list of thirty-five video game robots to a mere eight, their ultimate fate resting in the hands of our readers, a real-life robot, and random chance. While the nuclear explosion launched by a frightened U.S. military managed to wipe out the majority of the robot combatants summed to the Colorado branch of Kotaku Tower, eight were shunted off by emergency systems to other tower locations across the United States. But which eight? Your votes decided their fates. With only the top eight robots surviving the blast, they now face off against each other in the ultimate showdown of ultimate robot destiny, and you have a hand in determining the outcome...sort of. This is more than a war between robots. This is also a war between robots and humans...fiery passion and cold calculation...warm blood and twisted wires...you get the point. The winners in this tournament have already been determined based on random selection. Now it is up to you to represent humanity, casting your vote for who you believe will win each battle. Meanwhile, the evil Dr. Crecente will command his child's autonomous R2-D2 robot to do the same, using scraps of paper and the ability to freely roam about the floor using nothing but its robotic senses. So while the combatants battle for what amounts to their lives, you will be pitting human intuition against random robot behavior. Got it? Good. On to the fights! Autobot Commander Optimus Prime and Gordon Freeman's faithful robotic canine square off in New York City, home to the latest Kotaku Tower installation. Capcom's blue bomber materializes on the streets of San Francisco, immediately spying what is obviously one of Dr. Wily's newest creations, Meatbag Man. Perhaps ironically, the blue-haired avenging angel Kos-Mos finds herself lying in an impact crater just outside of the Los Angeles Convention Center, where E3 2009 is a week away from beginning. She stands, scanning the lip of the crater for hostiles, only to hear a strange whirring sound behind her, followed by, "I can see you!" And for some odd reason, Chrono Trigger's Robo and Penny Arcade's Fruit Fucker 2000 end up fighting in Raleigh, North Carolina. We didn't say this would make sense. 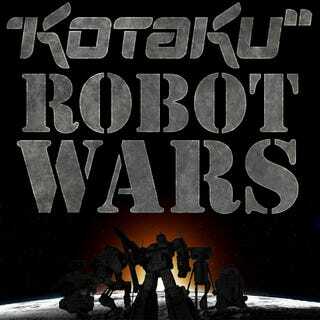 Cast your votes, and come back tomorrow to see who you picked, who R2D2 picked, and who fate picked to advance to the next stage of the Kotaku Robot Wars.